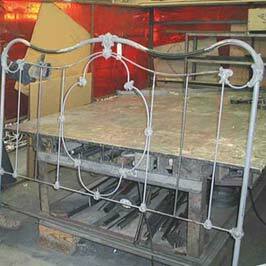 Cathouse Antique Iron Beds specializes in antique iron bed frames, and conversions. Cathouse Antique Iron Beds has the largest selection of antique iron beds in the country. 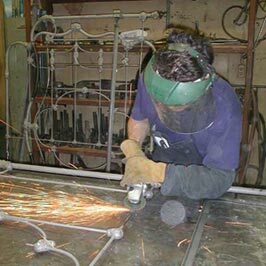 We first weld any additional width required to the antique double bed frame. We then grind weld joints down for a smooth transition from the old metal from the original bed frame to the added new metal. We inspect the welding and grinding performed to verify the blending will be seamless before we begin the casting process. Get A Quote & Place Your Order by calling (310) 457-1106 or fill out the form below and we will be contacting you shortly.